When we built our home eight years ago, we never intended to be living in it this many years later. We were planning to build, finish the interior ourselves (which we did), and sell within a year or two, and do it over again a few more times. That plan changed within the first year of living here, and even though we built our home for someone else to love in the end, we fell in love with the location and privacy we have here. We knew some of the design decisions we were making had to be those that the majority of buyers would want in a home. At the same time, however, it was crucial for us to make choices that we would also love and that would be statement-making. Our home is 1700 square feet, on one level – so the footprint is on a bit of a smaller scale. Taking the size into account, coupled with the fact that we’d intended to sell our home right away, our decisions had to be frugal and defy the constraints that come with a smaller build. Today I’ll be walking you through our favorite design choices that we made when we built this home. Choices that helped us save money, help give the illusion of a larger space and choices that are still as relevant today as they were eight years ago. Let’s get started! *Affiliate links are provided in this post for your shopping convenience – see my full disclosure policy here. I’m starting off with one of my favorite features that we chose in the design process. Our home’s architecture is that of an east coast traditional style, and has a heritage feel to it. Naturally, we chose to use finishes inside that would compliment the look and style of our home on the exterior. It’s very important to create continuity throughout your home from the outside in. Our home is an open concept design, which we maximized on even further with details that help to create a more grand, more open feel. 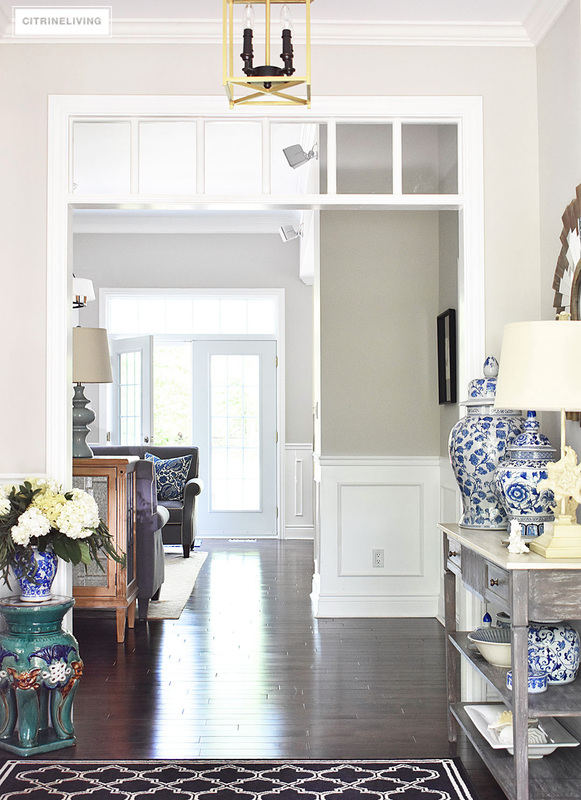 We used these traditional-style transoms in the front rooms of our home, as well as between the two spaces. We also made sure to widen the doorways as much as possible, to help visually enlarge the space, and let in as much light as possible as well. The front of our house is south facing, and we get a ton of natural light that pours in here, which helps create that feeling even more. Painting all of the trim work throughout our entire home the same color also helps with that continuity I was talking about. We used a bright, crisp white, Ultra Pure White by Behr. We recently made over our entryway with a new rug, mirror, and fresh coat of paint on our console table. It helped to brighten and visually enlarge this room even more. 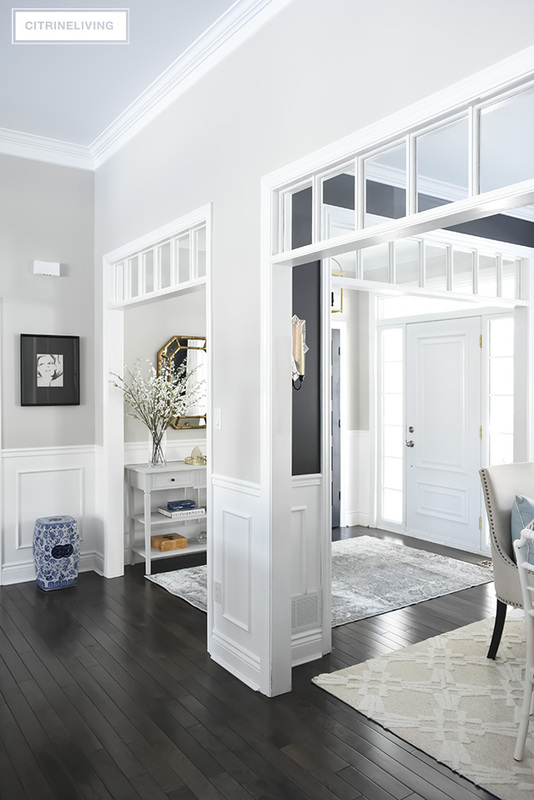 Even though we have a smaller layout, it was important to me to have a decent size entryway, with that open feeling that would also provide sight lines into the house. 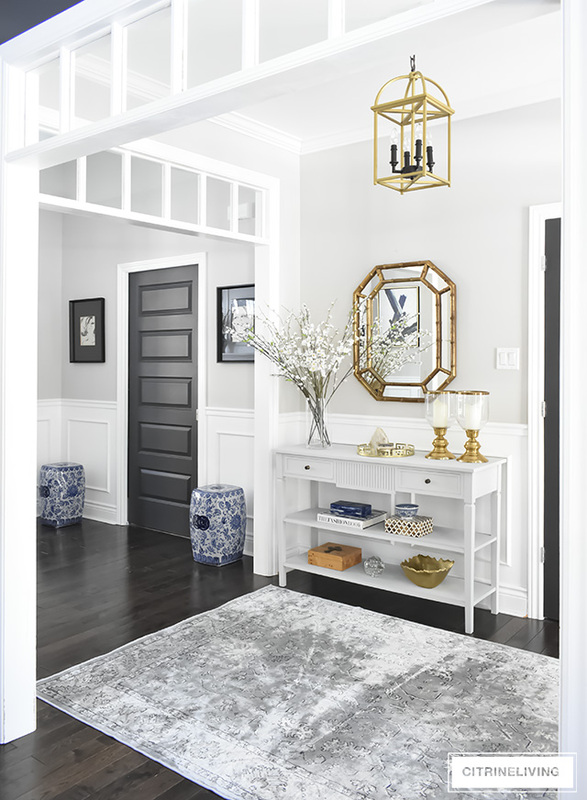 An entryway is the first thing people read when they come into your home, and it should tell your home’s story, and what is to come next. It’s your chance to make that first impression and wow people as the enter. 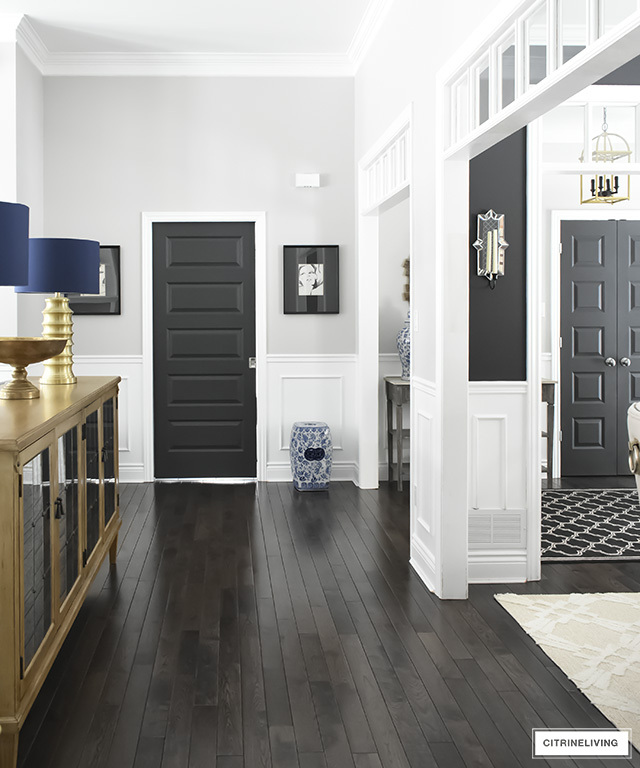 You can see this resent makeover of our entryway here. One of the other key features we chose, was to have continuous hardwood throughout our home, including the entryway. 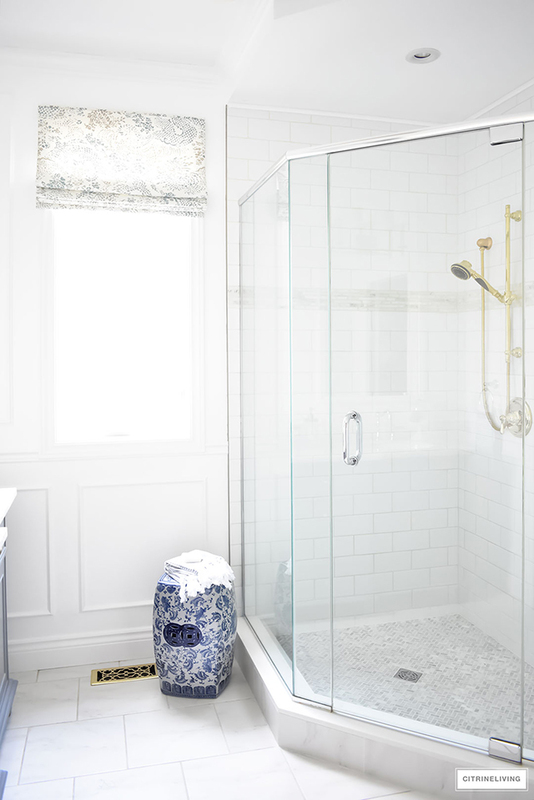 We did choose tile for the bathrooms and mudroom, which are all separate spaces. The rest of our house, which has one room that flows into the next, has the same floors throughout, which again, helps to create the illusion of more space. I purposely did not want tile in the entryway (even though we live in a northern climate) or kitchen. With a smaller footprint, you want to maximize on those visual illusions you’re trying to create. We debated back and forth between dark and light floors, and Neil really wanted to go with the darker tone – in the end I agreed as well. We do love them, they provide richness and an elegance, especially against the bright white trim. One of the cost saving decisions we made, was going with a mixed grade hardwood. We wanted a durable wood, so we decided on oak, however, oak can be pricey sometimes, so we needed to find something that was in our budget. We wanted to have variation in the grain as well, and it was important to us to get darks and lights throughout as well. Going with a mixed grade oak (A, B and C grades) allowed us to save money and get the look we were after. This is a walnut stain. Unfortunately I don’t have the brand or color name anymore! We did take our time shopping around, and we were so lucky to find a great deal on these floors. Take your time looking around, and talk to your builder – sometimes they’ll allow you to shop around and find your own materials which can save you money. 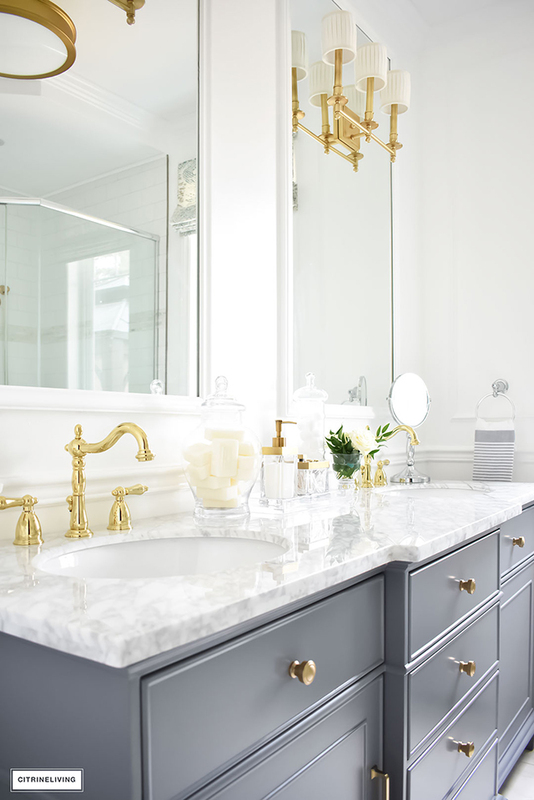 Our master bathroom is one of our favorite spaces, especially now that we recently made it over (see the full reveal here). It’s our sanctuary and we love every detail in this space. 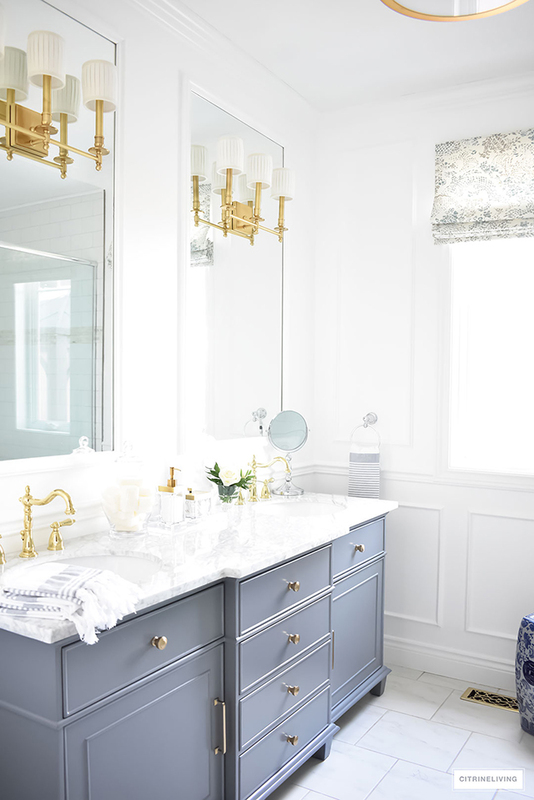 One of the things we love most, that was an absolute must for both of us, was choosing to have a double vanity instead of a bathtub. We could have gone with a bathtub/shower combination, but a walk-in shower was also a must for the two of us. I am not much of a bath person, even when we had a bathroom with a big soaker tub in our first home, it wasn’t a ritual for me, nor for my hubby. So, with the limited number of baths we would take, we decided the walk-in shower and a vanity that was large enough for the two of us to be in here together at the same time was a no brainer. I need my space when I get ready and having ample counter space is huge when you’re two people sharing a bathroom. Trust me on this one – it was one of the best decisions we made. Everyone needs their personal space and I highly recommend going this route if you have to make the choice and cut back somewhere. Again, having a smaller space to work with, you have to be able to comprise sometimes – this was a well worth it compromise for us! Our kitchen is one of my favorite spaces in our home. We’e made some updates along the way since we first moved in, which have brought it to a level that I love. 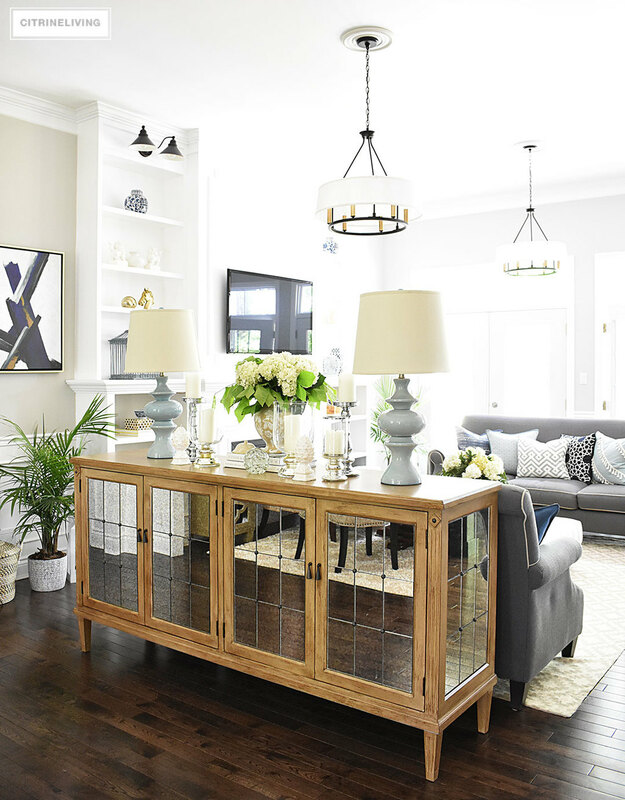 I still have some plans for this space, such as counter to ceiling mirrored cupboards flanking the sink – I have a big vision in my head that I think would be gorgeous, and will hopefully come to fruition some day! 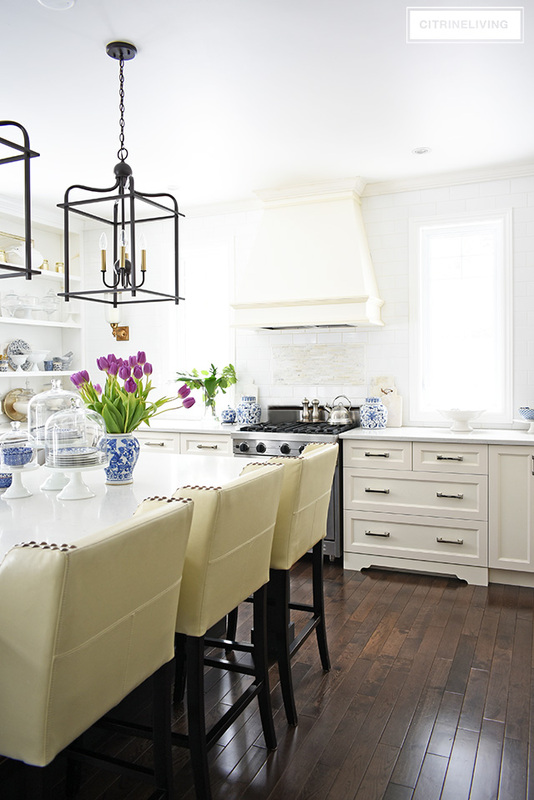 One of the most important design decisions in here was choosing to forego upper cabinets on the back wall and create a focal point with the custom range hood and flanking windows. 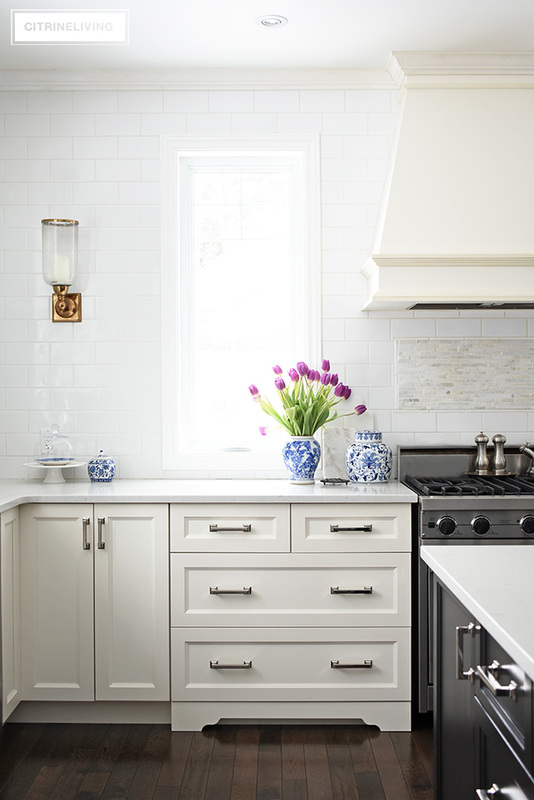 We installed counter to ceiling white subway tile to create depth, add visual interest and texture, and again, make a statement. We built the open shelves next to the sink (where I want to add the mirrored cupboards) to bring in some added character to the space and I love having a space to display my collections. You can read about it here. Having that back wall without cabinets was a design decision that is not for everyone, that’s for sure. 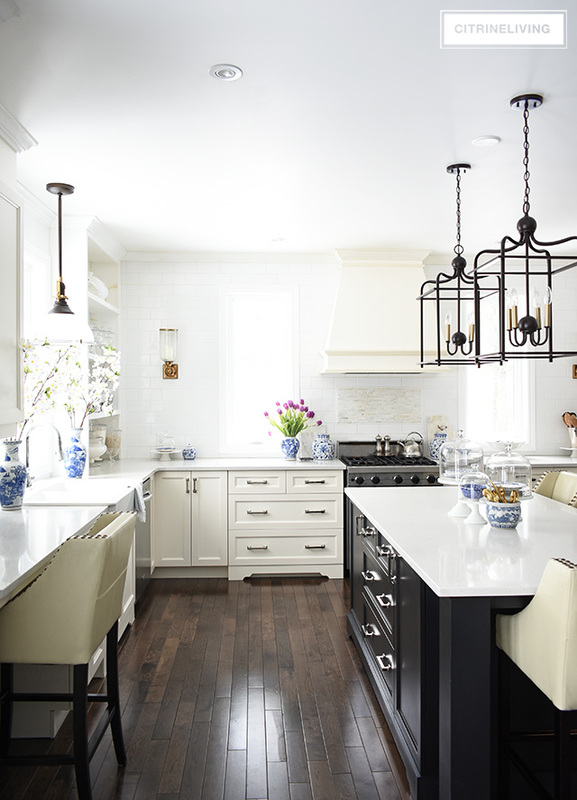 However I wanted to create a traditional kitchen that was atypical, and transport you to another era. I had an old-world-meets-modern-day vision fort this kitchen! We have ample cupboard space and our island holds all of our dishes and flatware, as well as trash and recycling and the microwave. It is one hard working island! 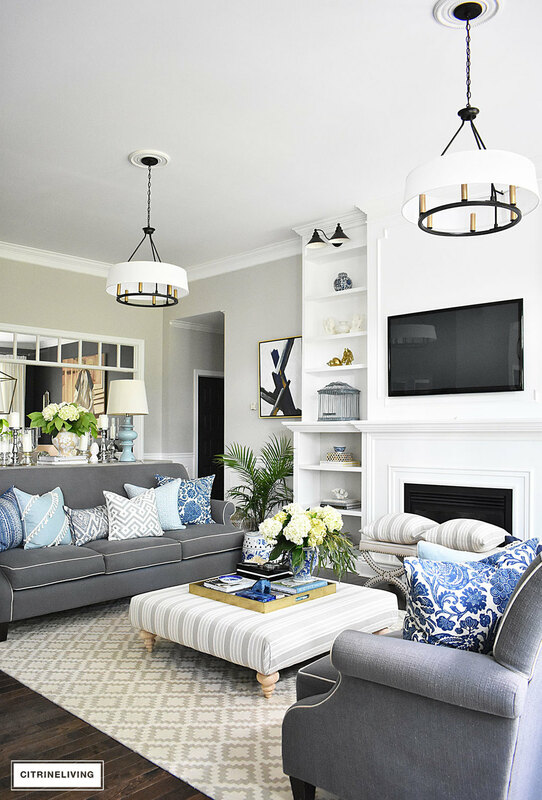 In our living room, or great room, which is central in our home, we wanted to make sure this space felt airy and bright since we spend most of our time here. The back of our home is north facing, and we don’t get much direct sunlight. We wanted to a make a big statement with as many windows as possible so we added the large transoms at the top as well to maximize on the height of the room. It was a small upgrade, but with a minimal investment, we have the statement we were looking for and this space gets great light year round, which is exactly what we wanted. By the way, I get a lot of questions about why we have no windows treatments. We have a very private yard, especially in the warmer months when the trees are filled in. I love having bare windows to maximize on the views of our foliage outside. We are in a very wooded area and we’re lucky to have so many trees to look at year round, it’s gorgeous! 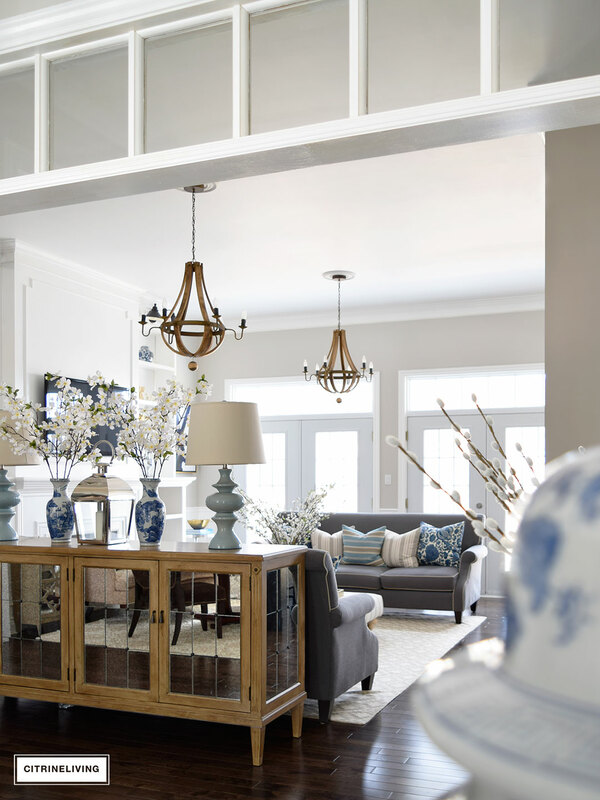 Building on the idea of creating a living room that feels as big and as bright as possible, we chose to raise the ceilings in this space from nine to eleven feet. We have nine feet everywhere else, and we realized during the planning stage that it would be a worthwhile investment to raise this ceiling – and it allowed for the taller doors at the back as well. Having the height in here makes a huge difference in the feel of the room and it also allowed us to make a big statement with the bookshelves we built after we moved in as well. You can read all about these shelves here. 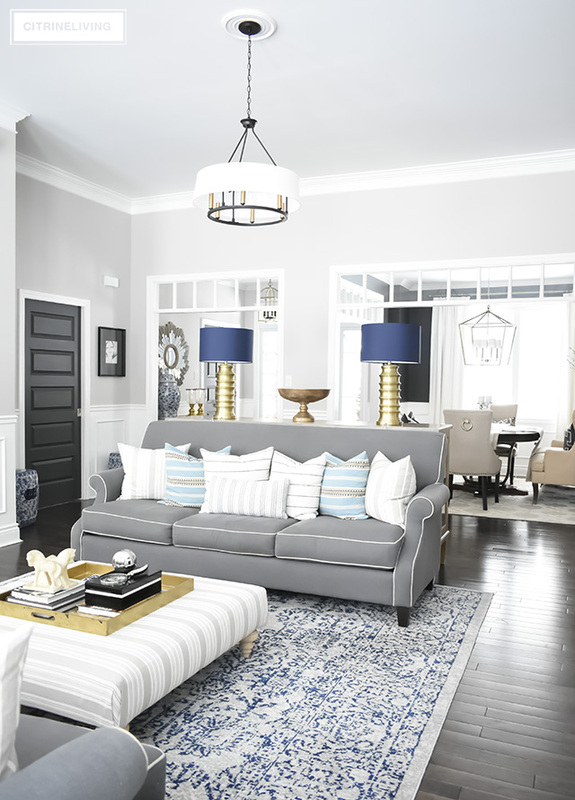 You won’t believe the difference in the room once we added them! Taking advantage of the height in here was a key factor, and makes the room feel even larger than before. I’m still talking about this room because it really is the central gathering space of our home (aside from the kitchen of course!) and the focal point of our home. We focused much of our energy in here to create a room with wow factor. Another detail we added was the double chandeliers. For a room this large – 15 x 23 feet, it needed the two lights for balance as well. I’m big on symmetry and that was another reason I wanted both lights. I love the way they frame our shelves as well. It was nothing to add a second light to the electrical plan, and again, the second fixture was a small investment…with big impact! OUR KIDS' SMALL BATHROOM MAKEOVER REVEAL! « A FEW OF MY FAVORITE THINGS ON SALE + CODES TO SHOP! We build a great room house for our retirement. Love it! The big homes we had are a thing of the past now the kids are gone. I don’t miss all the cleaning. We also added lots of windows to bring in the light. I’m loving your transoms. They add a touch of elegance to your space. When we beefed up the trim in our house, I was tempted to leave the drapes down, too. Unfortunately, we need them for privacy. Your home is absolutely lovely. It feels welcoming. Wow! I would have guessed your house was twice the size with the airy-ness and light that is captured in the photos. It’s absolutely beautiful. I’ve been reading your blog for about a year now and love your style. We built our house in 2008 but its just shy of 1500sf. I’m always looking for ways to look bigger, because with two small kids and a husband, I sometimes feel like the walls are closing in! 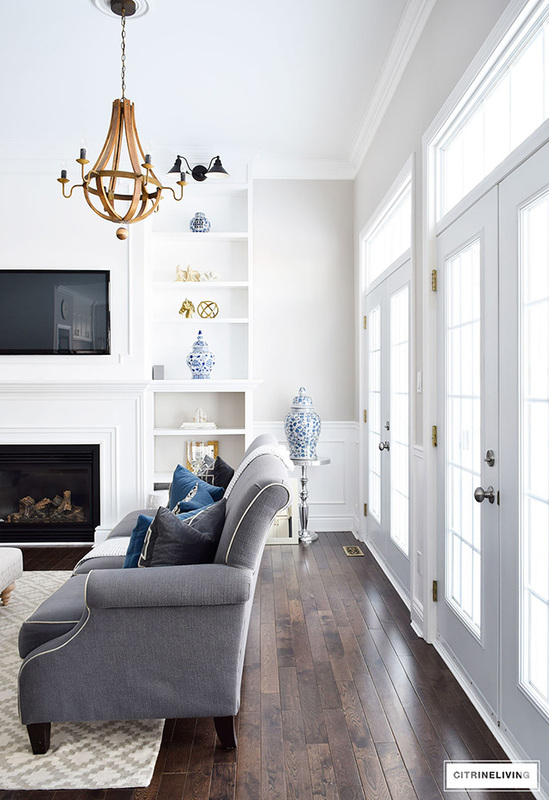 I recently painted the main areas of the home white which made a huge difference! I’ve learned to really edit my decor and be super choosy as to what gets to stay. New to your blog today through dimplesandtangles. Love this post! Could you share house plan name and if you would change anything to it now that you have lived in it? Loving so much about your house :). Have you built and sold houses before? Any blog post about that? Just read through your bookshelf addition- love! Hi- I have a question about your double black doors in the entry? Did you have them custom made or where did you find them? I am redoing our home and looking for similar doors but cannot find. Any advice is welcomed and appreciated! Thank you! Hi! We ordered them through our builder and the company who supplied all of the trim and wood for finishing our home. These are just a double door option for a standard door (I think it’s a 30″ opening), maybe check with home depot or a big box store, anywhere you’d order interior doors. You may have to order them custom though, I’m not sure! I wish I could be of more help! Hello. I love the brick on the exterior of the home. I’ve been searching online for weeks. Can you provide any information on where it was purchased? Thank you.